The former prime minister of the Turks and Caicos Islands, Michael Misick, posted a message on Instagram, warning people to brace themselves, amid fears Hurricance Irma could be a repeat of Hurricane Ike, which devastated the archipelago in 2008. "We experienced Hurricane Ike in 2008 that cost millions of dollars in damage but we have never been faced with a hurricane of this magnitude in modern times. A direct hit will be devastating for our country and set us back 20 years. I am concerned for the safety of our people and residents," Mr. Misick told Sputnik. "Turks and Caicos is low lying coral islands and it's predicted that we may experience 15 to 30 feet waves that would completely flood all of our islands. The worst we have faced is Hurricane Donna (in 1960) and the 1945 hurricane where hundreds died. Everyone is preparing, praying and hoping for the best but bracing for the worst," he told Sputnik. 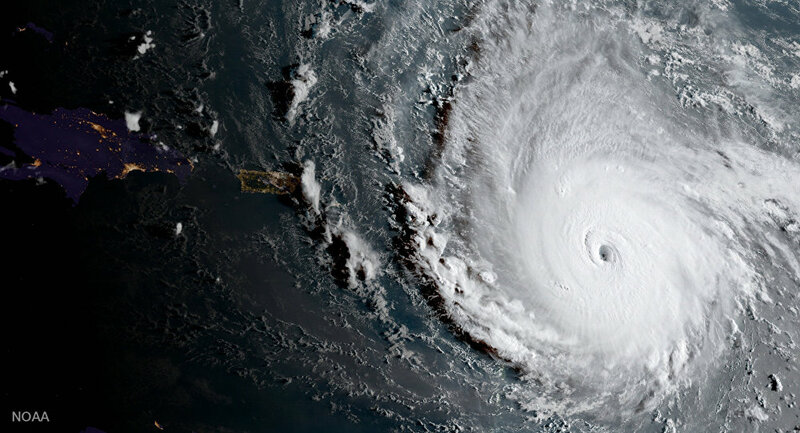 Hurricane Irma was upgraded to a Category 5 storm on September 5, meaning that it is significantly more powerful than Hurricane Harvey, a Category 4 storm which devastated Texas last week. Winds in excess of 180 miles per hour are hurtling towards the British overseas territory of the Turks and Caicos Islands, which is situated just to the south of the Bahamas. Several cruise ships are leaving the main island of Grand Turk on September 6, and the last ferry will leave North Caicos at 5.30pm local time. Only 31,000 people live on the islands, but the population is almost doubled by tourists from Europe and North America. Irma is already the strongest hurricane ever recorded outside the Caribbean and the Gulf of Mexico, and is estimated to make landfall in the Turks and Caicos Islands on Thursday, September 7. A storm surge of up to 20 feet is estimated for the low-lying islands as well as up to 20 inches of rain. The eye of the storm is passing to the north of Puerto Rico, and because it is not going over any major landmass it is due to maintain its strength. The Royal Navy ship RFA Mounts Bay, which was in the Caribbean tackling drugs smuggling, has now been put on standby to help out if the Turks and Caicos Islands are badly hit. In September 2008 Ike, which was only a Category 4 storm, slammed into the archipelago and destroyed dozens of homes on Grand Turk. The Royal Navy was then deployed to the islands to help more than 300 residents who were made homeless. Mr. Misick has been campaigning for the islands to become independent of Britain and says there is no reason why they could not be as successful as neighboring Saint Kitts and Nevis, which was granted independence in 1983. Mr. Misick and eight other people, including several politicians from his Progressive National Party (PNP), are currently on trial for corruption in the town of Providenciales. The London-based prosecutor Andrew Mitchell, QC, said the case was about "political corruption and financial greed," but Mr. Misick and his co-defendants deny all the charges and claim the case was cooked up by the British government.